Banjos Bushland Retreat consists of 3 luxury architect designed lodges, and private recreation centre. Banjos can accommodate 24 guests in beds with the use of extra beds in each lodge. Go to the Links for the details of our lodges, Swagman's Rest, Brumby's Run and Clancy's Lodges. When booking ALL 3 LODGES guests have the advantage of enjoying the ENTIRE RETREAT IN COMPLETE PRIVACY! All lodge bedrooms have en-suites, king-size beds (convert into singles), as well as 2 extra beds that can be easily accommodated in any bedroom. Bedrooms have ceiling fans, reverse cycle air conditioning, and electric blankets. Lodge is extremely spacious with 2 luxurious leather lounges, and slow combustion wood fireplaces, fully equipped kitchen and laundry, large covered decks with BBQ and outdoor furniture, and stunning bushland views from every room make you feel part of nature! Banjos is small enough to be exclusive, but offers the benefits of a large resort with activities for all ages! * Environmental Centre with literature relating to the flora and fauna that surround Banjos. * Close vicinity to local wineries, golf courses, heritage township, arts & crafts centre, ballooning. Banjos Bushland Retreat offers uniqueness to its guests by creating an unforgettable experience in a truly Australian environment. Not only does Banjos offer the "ultimate escape" by providing unhosted 4 1/2 star purpose built accommodation but its surrounds ensure an "up close and personal" encounter with many wonderful examples of the Australian flora and fauna - wallabies, kangaroos, kookaburras, king parrots, crimson rosellas, fairy wrens, firetails, bower birds, possums and lizards will all delight you with their presence. Full directions are given with confirmation of booking. In 2004 Banjos Bushland Retreat received the highest award in the Unique Accommodation category at the New South Wales Tourism Awards. As a result of winning this category for 3 years, Banjos was inducted into the NSW Tourism Awards Hall of Fame. This is an achievement that only a few organisations have achieved and one that we are extremely proud of. We have won in excess of 35 Tourism Awards since 2002. Hunter Region Tourism Award 2003 Award of Distinction. Australian Tourism Awards 2002, 2003, 2004 and 2006 - Finalist. We manage Banjos from our home in Sydney. Our family consists of Jenny, Malcolm and our daughter Alyssa, and our dog Cooper. Malcolm's background is construction, and engineering, and Jenny has a background of Administration and Office Management. We built Banjos from scratch - purchased the 20 acres of land in May 1996, and began building in June 1996, and completing the first stage of our property in March 1998 - consisting of our 2 & 4 bedroom lodges plus the recreation building. Our 3 bedroom lodge was added by June 2005 - completing our retreat. Malcolm wanted a hobby that would keep him busy - Banjos really fits the bill, as there is always lots of ongoing maintenance to keep up with. Banjos is not just another holiday destination - it has been set-up to make guests feel welcome, comfortable and happy from the very moment they arrive! Banjos is not just another holiday destination - it has been set-up to make guests feel welcome, comfortable & happy from the very moment they arrive, and is our 'labour of love'! Banjos Bushland Retreat is rated 4.5 star, and is very private, luxurious, spacious, family friendly and disabled friendly. Large groups can book all 3 lodges and have the entire retreat in complete privacy. We have won in excess of 35 Tourism Awards since 2002. Banjos is our 'labour of love'! Complimentary Shampoo, conditioner, soap, extra toilet rolls, hairdryer are all in each bathroom. Banjos is a privately owned & managed retreat with 3 luxurious lodges and private recreational facilities for the exclusive use of Banjos Bushland Retreat's guests. Family & disabled friendly! 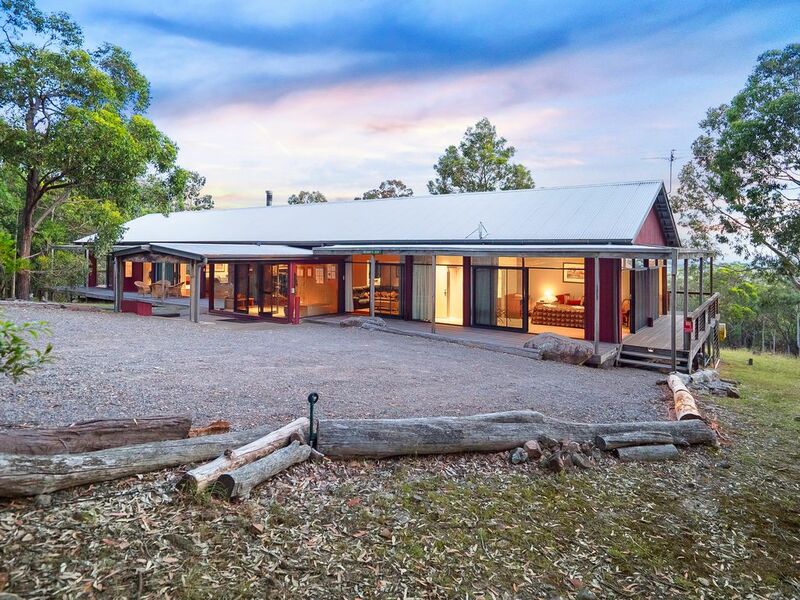 Banjos Bushland Retreat is on private 20 acres, set within 1,000 native reserve on the Moonabung Ranges. All bedrooms have reserve cycle air conditioning. Washing machine NOT COIN OPERATED. Laundry powder, clothes basket, pegs, clothes line provided. Undercover parking for 1 car, plus plenty of room for several more cars. Free WiFi provided - not for movie downloads. Extra towels provided in recreation bathroom for spa and sauna. Dishwasher tablets and powder provided. Tea bags, coffee satchels, sugar satchels, salt, pepper, baking paper, aluminium foil, gladwrap, paper towels and serviettes provided. Large amounts of crockery, cutlery, water glasses, wine glasses, champagne flutes, block of knives and cooking utensils. Tea towels provided. Extremely well equipped kitchen in lodge. One Television/DVD in living area, plus 2 bedrooms with a television each. Library of books, coffee table books, plus supply of magazines. For the exclusive use of Banjos guests, includes bathroom and kitchenette. Many board games provided in the lodge, plus playing cards and children's games. Large decks, front & back of lodge with outdoor furniture. Full-size tennis court for the exclusive use of Banjos guests. Rackets & tennis balls provided. We offer facilities for people with disabilities, ramps into lodges, bathrooms with shower seats, grab rails in shower, grab rails in toilet area, plenty of room for wheelchair, wide doorways. Salt-water swimming pool is located in just a few minutes from Banjos lodges. Large indoor spa with glass concertina doors and stunning views. Very relaxing and comfortable stay. Thank you Jenny and Malcolm. amazing environment, so many friendly animals around it is unbelievable. can't wait for a return visit. It is always a pleasure to hear that our guests have enjoyed their stay at Banjos Bushland Retreat! We love happy guests! Great getaway for a family to relax and see some wildlife. Had breakfast outside on the wide decks with parrots and kookaburras while taking in the bush views. Enjoyed a bush-walk, some tennis and a game of pool. Relaxed around the fireplace on the large lounges in the evenings after a home cooked meal with the family. We booked out all three cabins for 15 adults and I can say that we had plenty of space. The cabins were immaculate and we all thoroughly enjoyed ourselves. The local wildlife were very friendly and a few of us had the courage to hand feed them. Highly recommend this retreat for families or group of friends wanting a quiet relaxing weekend away. Had a great stay with a large group of families and small kids. The lodges are huge. So much space its overwelming. All nicely decorated. Very classy romantic cabins with fire places and quality furnishings. The glass windows are all around giving amazing views of the valley. Kanagaroos and possums come right up to the door. The reck centre is great with tennis court, spa and play ground. The pool was a bit far away at the Eagle reach resort though. It is a bit of a difficult drive up the mountain so take all the food with you. The kitchens have everything you need and BBQs. Worth the drive. Great place. Banjos Bushland Retreat is located on the Moonabung Mountain Range in the township of Vacy. Plenty of activities on site, plus many walking trails within the 1,000 acre reserve. Abundance of amazing wildlife to enjoy in their natural environment. * Historic town of Morpeth - historic buildings, craft shops, antiques, cafes and galleries.